The most dangerous form of skin cancer, melanoma is a malignancy of the melanocyte, the cell that produces pigment in the skin. 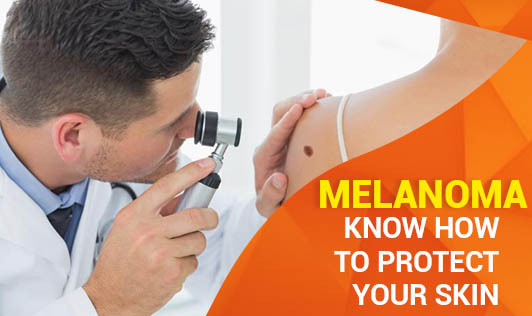 The tendency toward melanoma may be inherited, and the risk increases with overexposure to the sun and sunburn.Skin cancer is the most common cancer. Even though the benefit of skin cancer screening is uncertain, early treatment of skin cancer can be effective. Melanomas may be detected at a thinner stage with regular skin exams. Thinner melanomas are more successfully treated than are thick ones that have grown downward into the deeper portions of the skin. Total body skin examination. It is recommended you have a skin check every three years between the ages of 20 and 40, and a skin check annually over age 40. •Variable color pattern, meaning many colors or unusual colors, like blue or black. 2. Shade your Skin: Seek shade under trees, or create your own shade with a hat, shirt, or umbrella. 3. Beware of clouds: Up to 80% of the sun's rays can penetrate light clouds, mist and fog. You can still get sunburn on a cloudy day. 4. Slop on the Sunscreen: Use sunscreens with an SPF of 15 or more that contain both UVA and UVB protection. 5. Protect your Eyes: Radiation from the sun can damage cells in the structures of your eyes. UV radiation from the sun may increase the risk of developing cataracts later in life. UV radiation can also contribute to the development of skin cancer on the eyelid or on the surface of the eye. 6. Spot Check Your Moles: Examine your moles and freckles every month to check for any changes. Stay under cover and be safe!